Fun Time Rafting at Elo River Yogyakarta, Don’t Miss It! Are you searching for a thing to do in Yogyakarta that is able to call for your adrenaline? Then, you must consider taking a tour to Elo River and do rafting there. Rafting at Elo River is now a popular Jogja sharing tour package and missing the change to experience this in Yogyakarta must be disappointing! 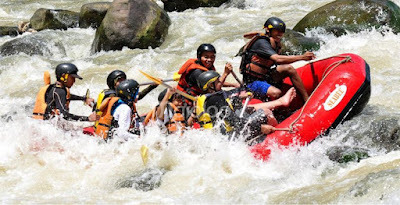 Elo River rafting is no doubt a great thing to do when you are visiting Yogyakarta. Located in Magelang which is not so far from the downtown area of Yogyakarta, this outdoor activity can be a nice getaway from the hustle bustle of the crowded city. Then, what makes it an excellent activity to do? There are actually some reasons why you need to take this activity into account, so here we go! When you decide to take part in Elo River rafting, you have got the chance to visit such exotic river that comes with quiet, peaceful and beautiful surrounding. You will be able to get relaxed listening to the sound of birds, wind and flow of water. Along your journey, it is not impossible for you to see various kinds of vegetations. It will make the Jogja sharing tour to Elo River a lot of fun and interest because you are not only enjoying the flow of the river, but also the surrounding which is seriously hard to be ignored. As you do rafting along the river, you will have a chance to experience some different geological process of the river as well. Sometimes you will find that the river is rocky while sometimes it is sandy. That’s why it will be a lot of fun to join the rafting. Next, it will be complete if we are also talking about some of the guides to have fun at this river. So, here are some of the things that you should take into account. There are actually several possible ways that you can take to get into the location. First, you can take public transportation for dirt chip choice. However, if you don’t want to get bothered by the itinerary and how to take the public transportation itself, you can consider renting a car with a private driver or join a sharing tour that is now available everywhere. It is recommended for you to wear T-shirt and shorts to get the most of your rafting time. However, you can also consider changing into your swimming apparel for more comfortable one. Then, don’t forget to bring some extra clothes as well since you will get all wet. Now, it is the time for you to find the best Jogja sharing tour provider that can bring you to have fun at Elo River. Visiting www.jogjabromotour.com is highly recommended for you. This is because the site offers the best Elo River rafting tour. So, don’t miss it!